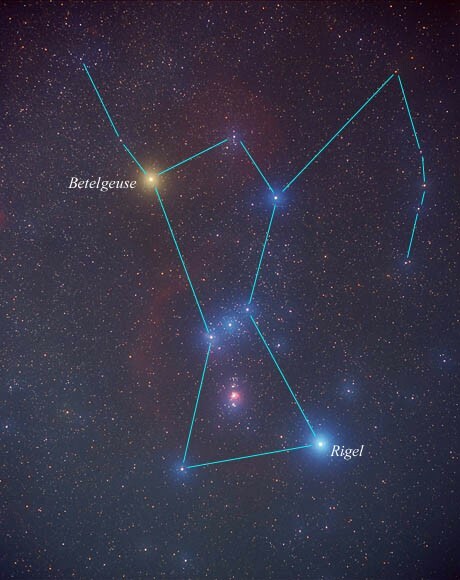 Above is the constellation Orion showing the red giant Betelgeuse. Over 600 light years away, and almost 1,000 times larger than our sun, Betelgeuse is one of the biggest stars known. The red supergiant is also one of the most luminous stars, emitting 100,000 times more light than the Sun. If it were put in the sun’s place in the solar system it would extend to Jupiter. Betelguese is reaching the end of its life and will become a super-nova at some point within the next 100,000 years – or so. Does that mean that the event could happen tomorrow? Yes. How likely is that? 36,525,000 to 1 or in other words, about as likely as you winning the EuroMillions lottery. The calculation is a simple one: 100,000 years x 365.25 = 36,525,000. If it happens will it effect us? Yes. It will for a few weeks radically increase the level of cosmic rays hitting the Earth. Cosmic rays, emanating from stars hundreds and thousands of light years away reach the Earth and hit gas molecules in the atmosphere and form the nucleus of what becomes a water vapour droplet. These in turn form clouds, reflecting some of the sun’s energy back to space and cooling the Earth. The numbers of cosmic rays vary. When there are more cosmic rays the Earth is colder. When there are fewer cosmic rays the Earth is warmer. Our solar system moves through the Milky Way galaxy. During its passage – which takes millions upon millions of years – the solar system moved through regions of space with intensive cosmic radiation and them through regions of low cosmic radiation. The sun’s activity deflects some of the cosmic radiation. The Earth’s magnetic field also blocks some cosmic rays. Records of that field for the past 200,000 years show an extremely close match between “ice ages” of varying duration and severity and times when the magnetic field allowed more cosmic rays to hit Earth. Of course when we realise that Betelgeuse has become a super-nova – it will be as bright as a crescent moon so one won’t be able to miss it – we will be looking at an event that would have taken place way back in the 14th century. So what can the dearly beloved Chris Huhne, the Right Honourable Member for Eastleigh and Secretary of State for Energy and Climate Change do about it?